In rocky areas throughout BC coast. Establish dens in caves or rocky areas, or smaller individuals may dig dens in sand-shell substrates; inhabits deep water from February-April and August-October; females brood eggs on roof of dens; planktonic larvae until 50 mm length, then remain benthic. Subtidal, to a depth of over 100 m; inshore dens usually from 13-30 m.
Sexually mature at 2-3 yr, males after 12 kg and females after 20 kg; at 1 yr weighs 1 kg and 12 kg after 1.5 yr. Length can be as long as 30 feet by full maturity. 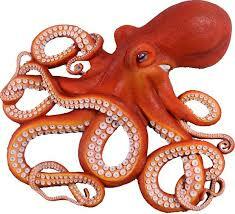 The octopus has eight tentacles that sometimes stretch 4.8 m across in a 45 kg specimen. The octopus is a mollusc that is related to the squid, oyster, clam and snail. The giant Pacific octopus is the major species on the west coast and also the world's largest. It is illegal to use jigs, gaffs, spears, rakes or any other sharp-pointed instrument to take octopus. Useful for halibut bait and occasionally desired as an ethnic food, Octopuses are sometime sought for their own merits. Generally, however, they are accidentally caught in cod fish traps and harvested along with the intended species. Octopuses are best caught with a trap method, rather than bait and hook. Research locations for octopus hunting. Ask at local fishing docks and consult with Fisheries and Oceans Canada for accurate information. Learn octopus-fishing strategies. An excellent reference is "Fishing for Octopus, a Guide for Commercial Fishermen" by Brian C. Paust. His handbook discusses octopus species, fishing techniques and gear suggestions. Acquire a standard ground fish pot trap/cage. The company E-Z Traps makes several models, but you may also be able to purchase them used in fishing towns or even make your own. Bait and set the fish trap. Fresh raw fish is standard bait that seems to attract octopus. Sink the trap in a strategic area, allowing it enough rope to rest on the bottom of the ocean. Octopuses live in den-like habitats in reefs and rocky substrate. Octopuses are usually found towards the shore from May to July and November to January. They tend to be offshore from February to March and August to October. Check the trap by bringing it to the surface of the water. This is done more easily during low tide, so consult a tide chart. Traps should be checked after 24 hours. Remove octopus with a net. If more octopuses are desired, re-bait and sink the trap. Below you’ll find some additional resources to help you catch octopus. I hope the information provided on this page will help improve your octopus fishing success and your success as an angler overall. Feel free to share this website with your fellow anglers to show your support for my website. I know, who wants to share the fishing secrets but the best way to thank me is to promote my website. Fishing for Octopus in Alaska: A Guide for Commercial Fishermen - by Brian C. Paust. Only 47 pages, but it contains everything you need to know about fishing for octopus. Octopus – Wikipedia – Learn more about octopus.